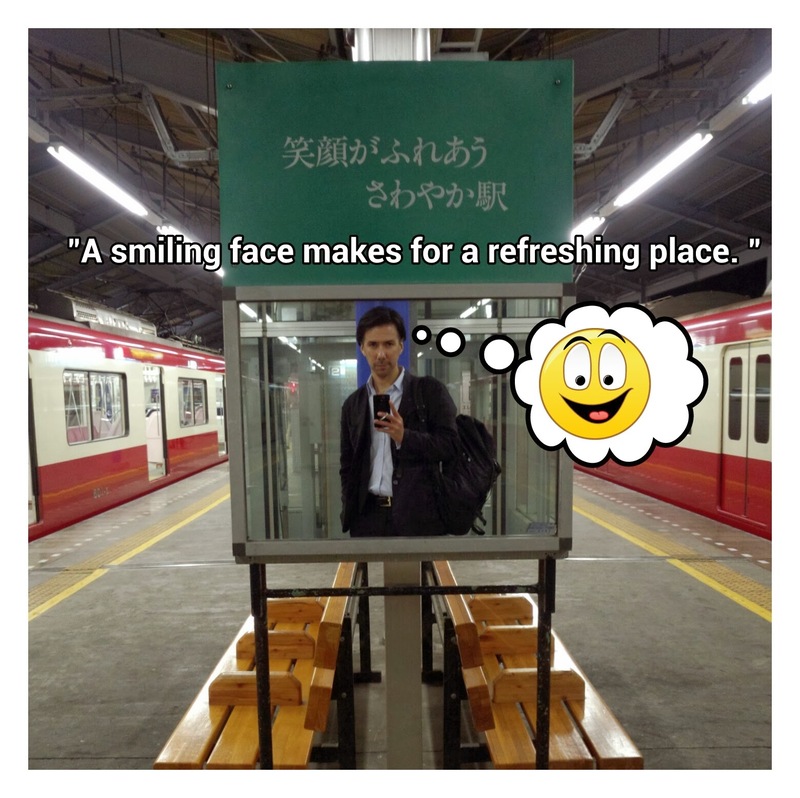 This blog is a collection of my experiences and observations of Japanese life. 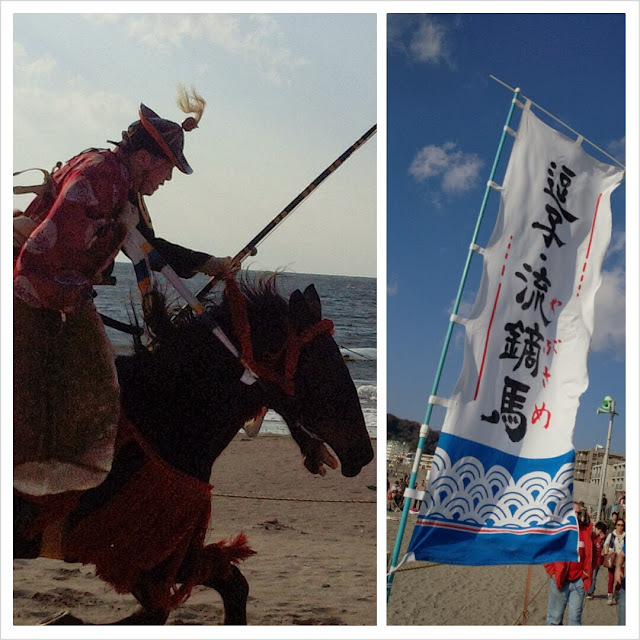 I intend to show the differences in the way of thinking of Japanese people. By reflecting on these differences, I hope that the readers can pick up something that will let them see their own lives and the world around them a little differently. One benefit of living in Japan is being able to read and practice my Japanese skills daily. In this blog, I want to share the Japanese I have learned. The advertisements and posters on the train provide a great opportunity for study. Here is a poster that I saw on the train today. It is a warning for people not to run into the train as the doors are closing. かけこみkakekomi- last minute rush, stampede. I had gone to watch yabusame once before in Kamakura, but it was so crowded, and the area was so small that all I ended up seeing was a guy on a horse galloping by for about 5 seconds before disappearing behind the trees and people. Watching it on the beach in Zushi was much better. The event started with a small taiko performance. 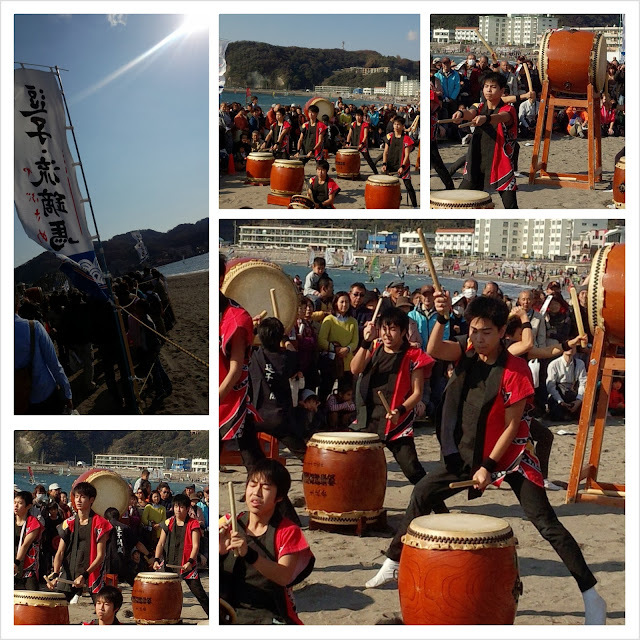 There is nothing like the thundering rhythm of Japanese drums to get one in the mood for a display of martial arts. 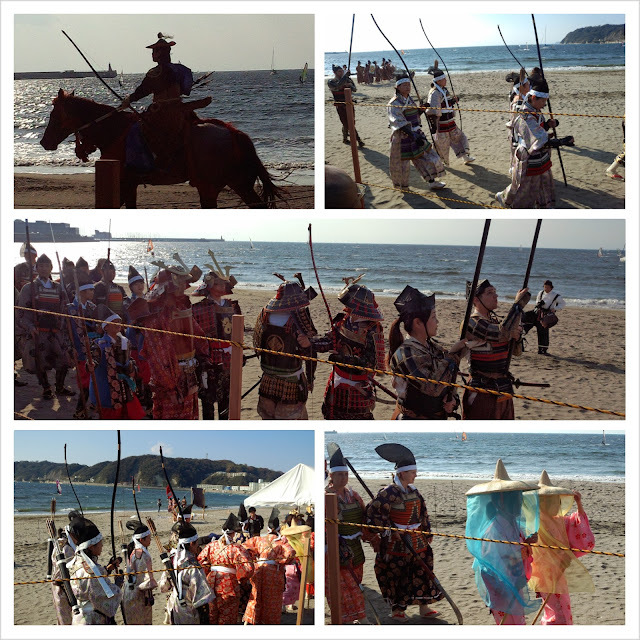 When the participants came out fully dressed in their samurai clothing, the soundtrack from "The Last Samurai" began playing in my head. It was awesome seeing a group of about 20 to 30 people all dressed in clothing from the Kamakura period proceed down the beach with their horses by their sides as the ocean waves could be heard crashing on the shore with picturesque mountains in the background and a fierce wind to welcome them. I could almost feel that I was really back in that time period about to witness a battle, except for the sights of windsurfers and yachts in the bay. 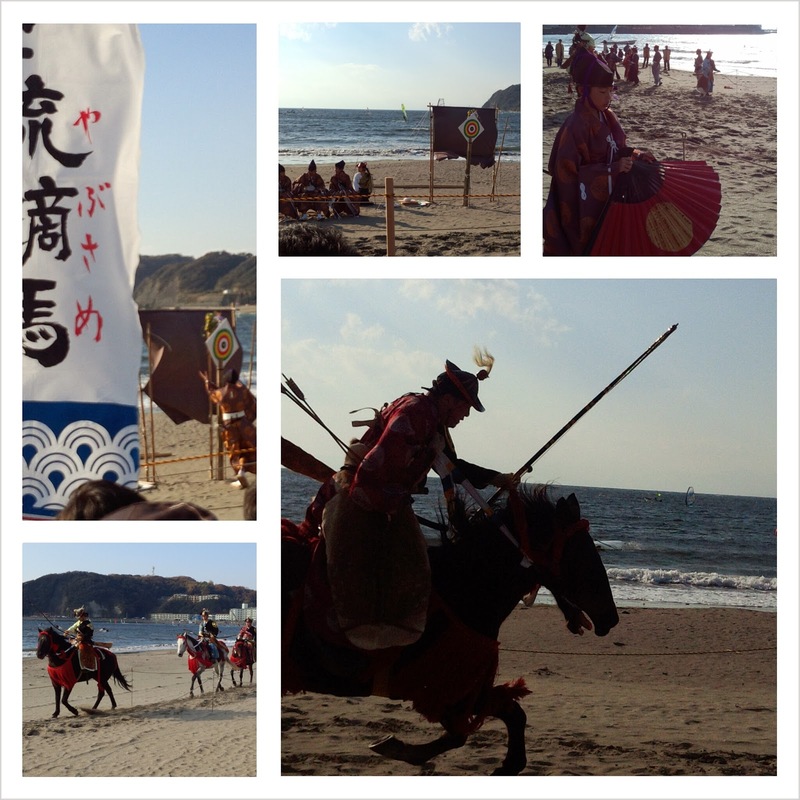 Many people probably consider the sword to be the primary weapon of the samurai, but it was actually the bow and arrow. Since archery skills were vitally important to the samurai, the Shogun of Kamakura was a little upset when he learned that his warriors, well, sucked at it. So began the Yabusame demonstrations in and around Kamakura hundreds of years ago. I feel lucky that I live so close to an area with so much culture. If I remember correctly, the course for the archers was about 250 meters. 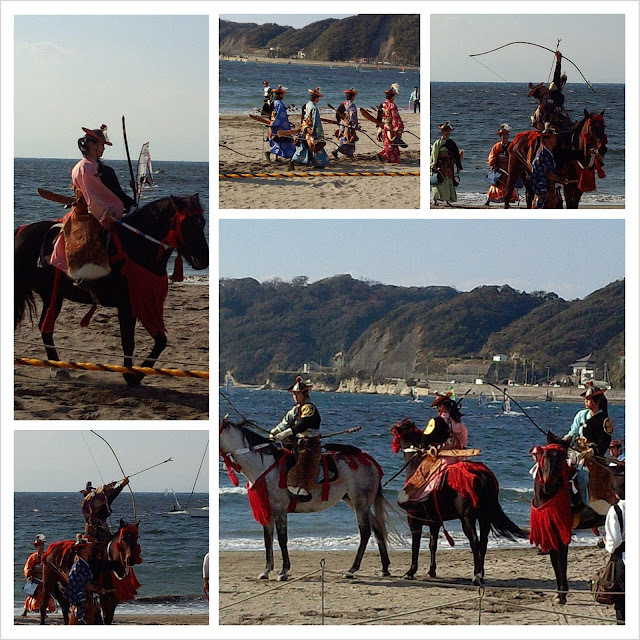 Three targets were set up, and the archer had about 15 seconds total to load, aim, and fire his arrows at all three while at the same time steering a horse galloping down the beach. I was standing on the side of the course near the second target when I heard the sound of the horse's hooves pounding the sand like rolling thunder across the skies. As the archer approached the target, he raised up his bow and let out a yell... IN-YO....., which is akin to the meaning of yin and yang. The horse and its rider almost instantaneously disappeared as a loud cracking sound split the air. The arrow had hit its target. Yabusame, like many martial traditions in Japan is not considered a sport, but rather as a means of personal development. 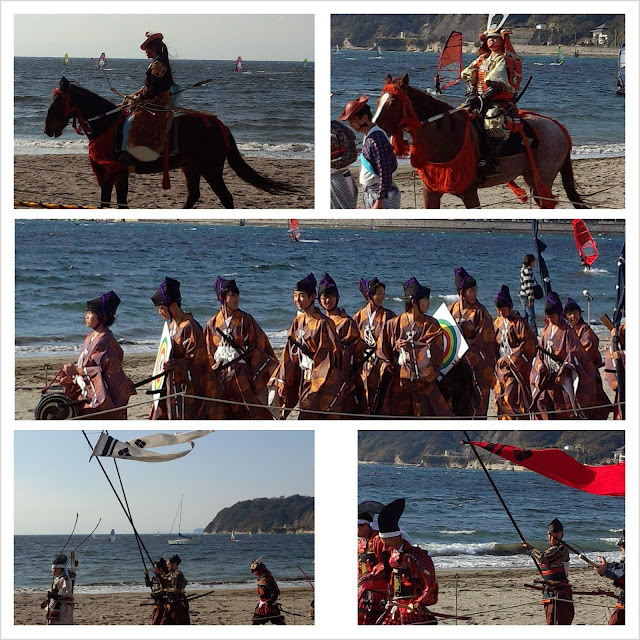 One who practices yabusame works to improve concentration, discipline, clarity of the mind, physical fitness and to live with respect and honor. 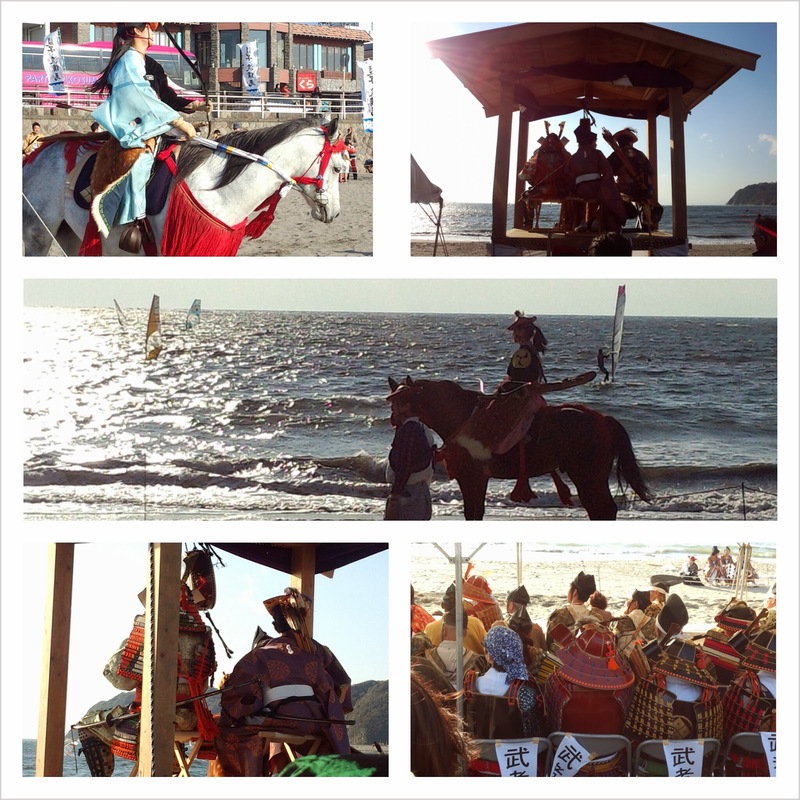 The skies were clear that day; the wind was strong, and I was reminded once again of the spirit of the samurai. Niko-niko is a word for smile in Japanese. It seems that nearly every person I meet here is smiling. Ever seen the movie Pleasantville? Yea, that's where I live. Today after my lesson at the pre-school, I noticed the secretary lady (the one with the soroban) had her webcam on. The funny thing was, however, that she wasn't chatting with anyone, she was just using it as a mirror. She told me it reminds her to keep her happy face on and remember to smile while she is working. Everybody knows that Japanese people think more about the team, the family, the group more than they think about themselves as an individual. So, even if a person is not feeling well, or may have something grim in their mind, they see it as an obligation not to bring everybody down with a frown. Sometimes, it can get annoying though, when you are having a serious discussion or disagreement with someone, and you notice they seem to be grinning. There are also times when I am having a bad day and see someone coming down the other side of the escalator looking like they just found the end of the rainbow. Ugh. I know some western people think that Japanese people are being fake because they don't show their true feelings in this way. A smile is just one of the many ways that they try to promote the happiness of the group. Maybe I should work more on my own sunshine. For people like me who forget to put on their smile on the morning, there are mirrors around, like say, the on the train platform for reminding people to turn their frown upside down. I suppose that since there is no Thanksgiving holiday (or black Friday) in Japan to act as a buffer for the holiday season, I will have to get used to having an early Christmas season. It's just the first week of November, it's not that cold, and the leaves aren't even on the ground yet, but the stores have begun playing their Christmas tunes and selling reservations for Christmas cake (I'll get to that one later). There is just something strange about it. Kannon is the Japanese name of the goddess of compassion and mercy. The Chinese characters are written as 観世音, or "hearing the cries of the world". 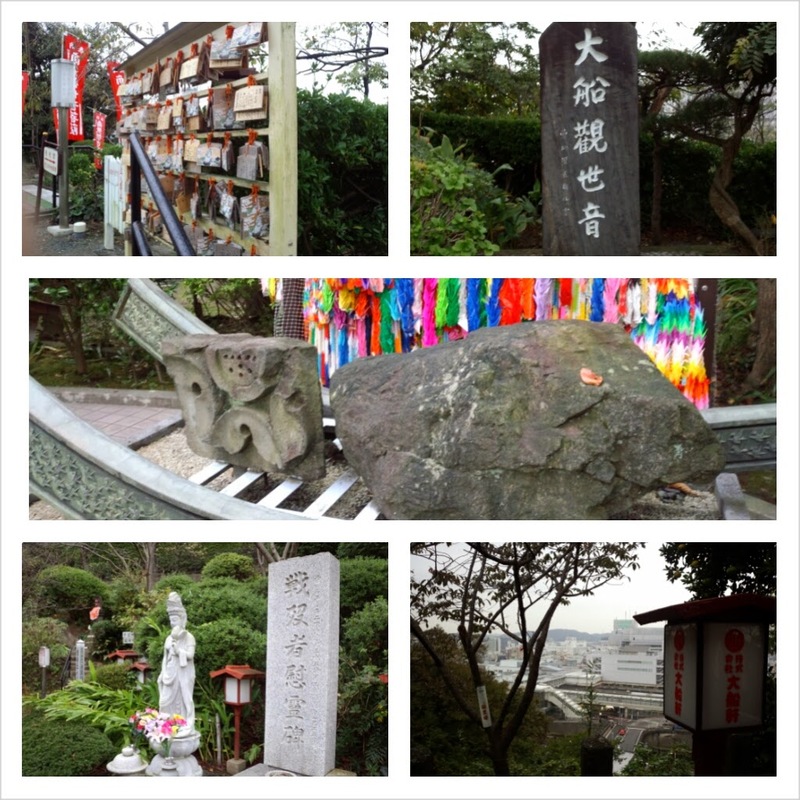 Kannon is not just a Japanese goddess, but is also well-known throughout eastern Asia. In China she is called Guanyin. 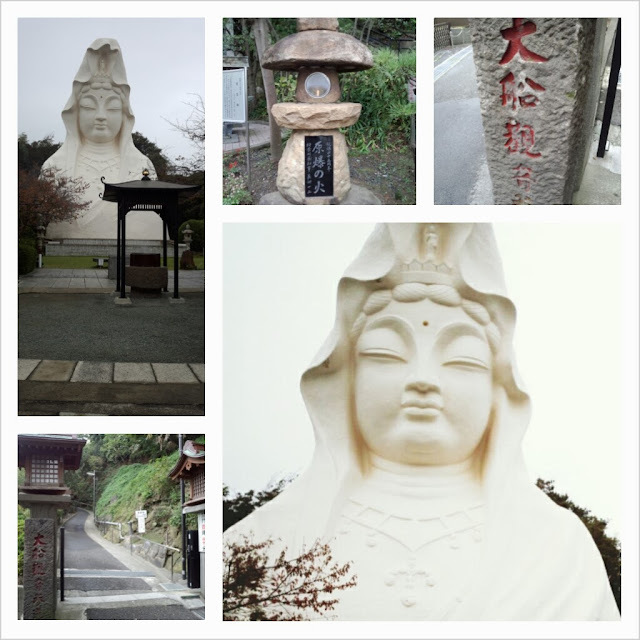 In Ofuna, just next to the train station is a giant bust of Kannon, a beautiful woman wearing a white robe. Not many foreigners come to Ofuna for sightseeing. Many of the visitors are locals who come to pray. As I began to climb the long set of stairs to the top of the hill, I could see the top of her head and she seemed to be peeking down at me. When I reached the top, I found a board with many hanging emas, and in front of me stood the magnificent white statue. The statue overlooked the city of Ofuna and provided an excellent view. It was as if the statue was indeed looking out over the whole world. Ironically, it was first erected in 1929 for world peace, but construction was halted in 1934 due to war. At the bottom of the hill there is a memorial to the victims of the nuclear bomb attacks. The memorial contains a thousand paper cranes (千羽鶴 senbadzuru), and rocks that were taken from ground zero of Hiroshima and Nagasaki. The most interesting part is a flame kept in a lantern that was lit from the burning rubble of Hiroshima. Perhaps many people do not know, but there is a famous Buddhist saying is attributed to Kannon. Form is emptiness, and emptiness is form"
Visiting this statue made me think more about the virtue of compassion. It is a fundamental teaching of both buddhism and Jesus Christ.
" 情けは人の為ならず Nasake wa hito no tame narazu; The good you do for others is the good you do for yourself "
One thing that is the same in American and Japanese culture is the lack of the ability to accurately to predict the weather. The forecast was for sunny/partly cloudy skies, but instead I got rain. 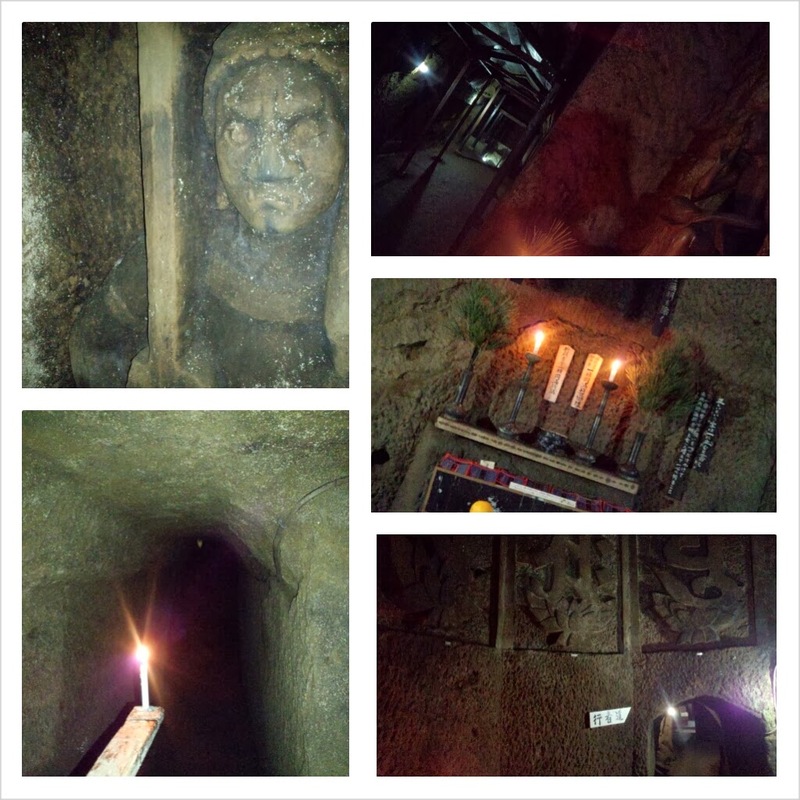 Since my plans to go hiking were rained on, I decided to go on an indoor adventure in the Taya caves of Ofuna. The Taya caves isn't a popular sightseeing spot, and I only found it after spending some time scouring the internet for something to do on a rainy day. It was about a 10 minute bus ride from Ofuna station. 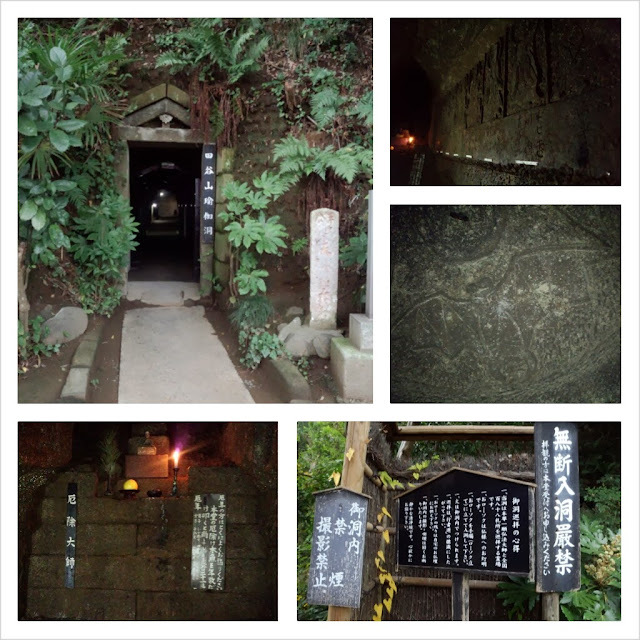 The word for caves in Japanese is "doukutsu" 洞窟 It was started when Kamakura was the center of Japan, and was continued for about 500 years until 1720. I followed the signs off the main road to a temple in front of a mountain. At the entrance I paid for admission, then picked up a candle to light my way. The entrance to the cave was quite small, and I had to bend down a little to enter. When I entered, I noticed it was eerily quite. No one was inside except me! I was worried that I might fall down a hole and huge Japanese spiders would eat me alive! I like sightseeing spots like this though, that are off the beaten path, where little is done to preserve it or make it more appealing to tourists. It seems more natural this way, and I can really feel a connection to the past through its natural authenticity. The caves were a network of narrow tunnels of about 1.5 km. It was made for the purpose of being a Zen dojo. There was one long corridor with a long stone platform, which was used for Zen meditation. I saw many statues of Buddhas, and ancient carvings on the walls of dragons and other animals of the Chinese zodiac, Sanskrit characters, and of Kannon, the goddess of mercy and compassion. 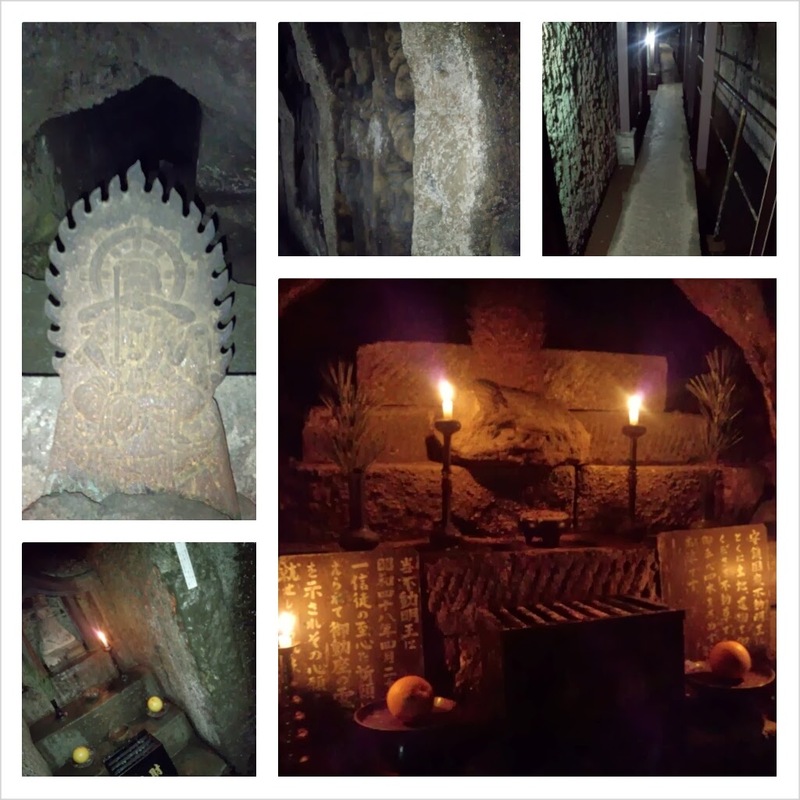 Even though there were small lights inside the tunnels, I still had to use my candle to examine the carvings more carefully. The cold stone walls were wet with mildew, and the sound of water could be heard coming from somewhere even farther inside. Finally, at the deepest point, I found a chamber with a small spring of water creating what is called the "noiseless river". I could imagine how this could be a great place for meditation. From inside the chambers, the world outside disappears. No sunlight, no wind, no signs of daily life. Only the flickering light of a candle and one's own mind are all that can be seen or heard. Once deep in meditation, the candle would also disappear, taking with it the sound of the flowing water leaving only the mind. Deep inside the tunnels, I still couldn't believe that I was doing this all alone. I felt like I was in an Indiana Jones movie, and if I could find a secret lever, a hidden door might open and reveal a room full of golden Buddhas.....or snakes. HOW TO GET THERE: Take the number 72 bus from the number 4 bus stop in front of the East entrance of Ofuna station. When you board the bus, you will have to tell the bus driver where you are going so that he can adjust your fare. Just say "Doukutsu mae", which is the name of the bus stop. Everything is so cute in Japan, and maybe that is why Halloween doesn't have the same feel as in he U.S. . 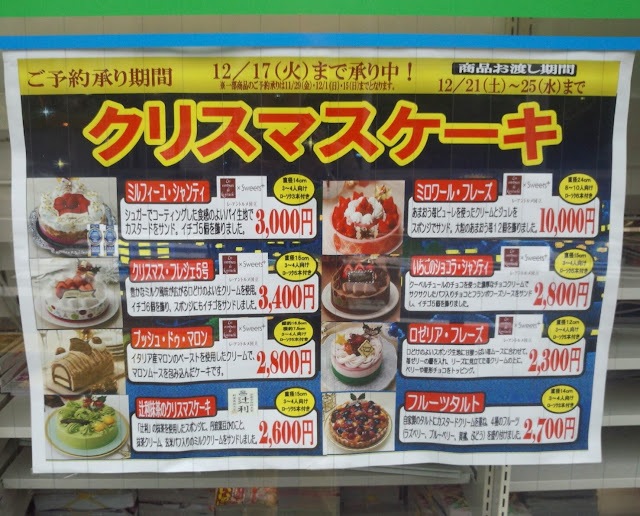 While a lot of stores have Halloween decorations, I think that this holiday is one that will never catch on in Japan. For one reason, Japanese kids generally don't eat that much candy. I am surprised at times when some kids tell me they don't like chocolate! I feel sorry for the Japanese children that are deprived of all the sugar that I had in my childhood. The most notable difference is the absence of trick-or-treaters. Knocking on strangers ' doors asking for candy is impossible in a culture where people apologize for every inconvenience made on others, worry about what others think, and where every favor is paid back generously. 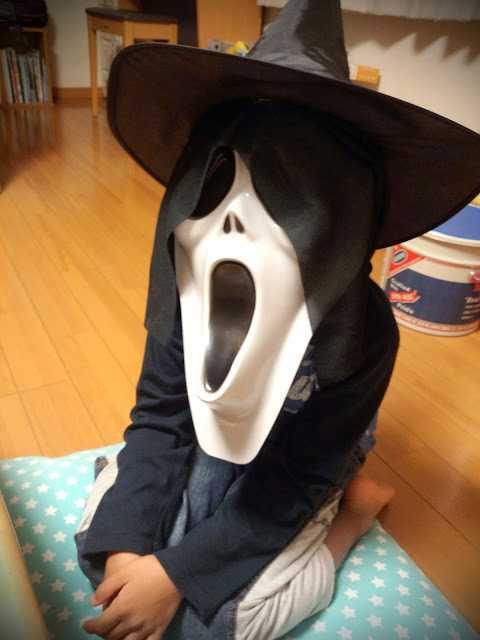 In the land of Pokemon, Kitty-chan and never-ending cuteness, it also comes as no surprise that Japanese kids don't seem that accustomed to scary things. So last year when I dressed up as a skeleton donning a Scream mask and walked through the neighborhood on my way to a student's house on Halloween, I think I freaked out a lot of Japanese kids. An old woman came out of her house to scold me. "You're scaring the kids" , she said in a harsh tone." Sono tsumori dayo", I thought to myself. "That was my intention".